Spring training has begun! 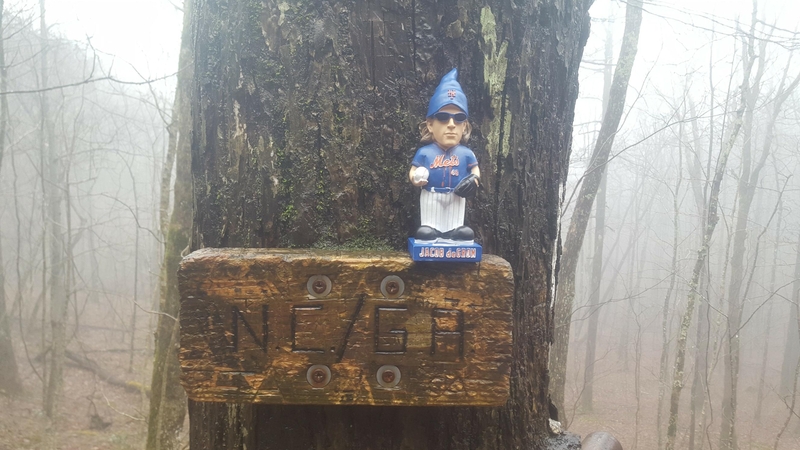 And it got me thinking about my unusual experience with a luxury item I brought with me on my thru-hike – my Jacob deGrom garden gnome. A quick refresher on the start of the Mets’ 2015 season: They started off strong. Despite their closer (Jenrry Mejia) being suspended for PED use, they hit an 11-game win streak and were looking like an early contender to win the division. But in true Mets fashion, they had everything go wrong all at once: David Wright was diagnosed with spinal stenosis, Jerry Blevins was hit by a baseball and broke his arm, and Travis D’Arnaud got hit by a pitch and went on the IR. This all happened about a week before my sister and I went to go see them play the Washington Nationals. 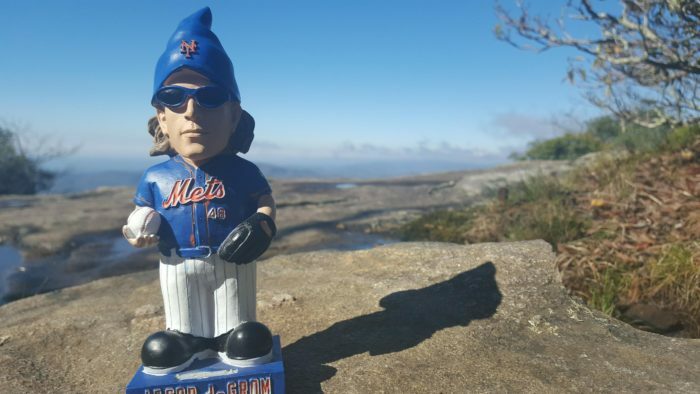 I brought my little sister to the game specifically because of the giveaway: a Jacob deGrom garden gnome. We made a whole day out of it; we took the train into the city, grabbed a quick bite downtown, then hit the subway to make sure we were in line early in case they ran out of gnomes. I downloaded the MLB at-bat app and would listen to the games when I had service. 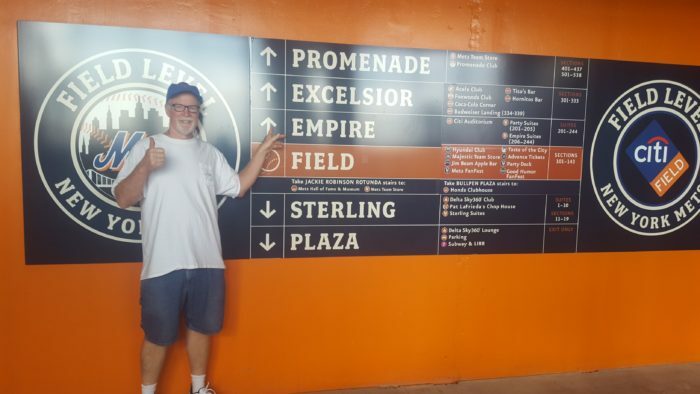 For a majority of the games I would only have a signal toward the summit of a mountain, so I would try my best to run through gaps in between innings or would take extended lunches at a spot that had good service if there was a particularly good game on. I probably got to listen to about a third of the games, which turned into a good hiking companion. 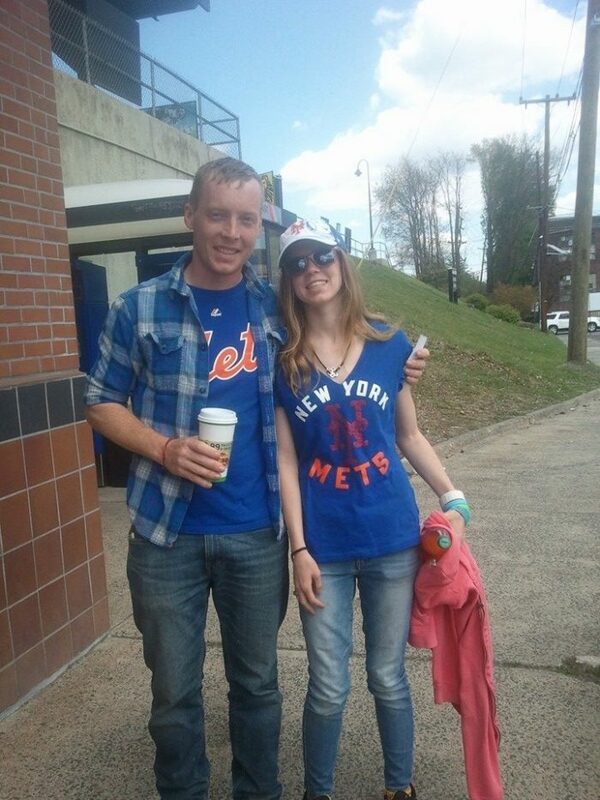 Halfway through the hike (the day I passed through Pine Grove Furnace and dominated my half gallon of vanilla ice cream) I was stopped for lunch and saw the Mets posted an Instagram contest: “Are you the biggest Mets fan?” The prize was two suite tickets to a game later that month that timed up with me passing through New Jersey. I’m not usually one to enter these contests, but I figured my situation was distinct enough that I might have a chance. Below is the picture and caption I took for my entry. 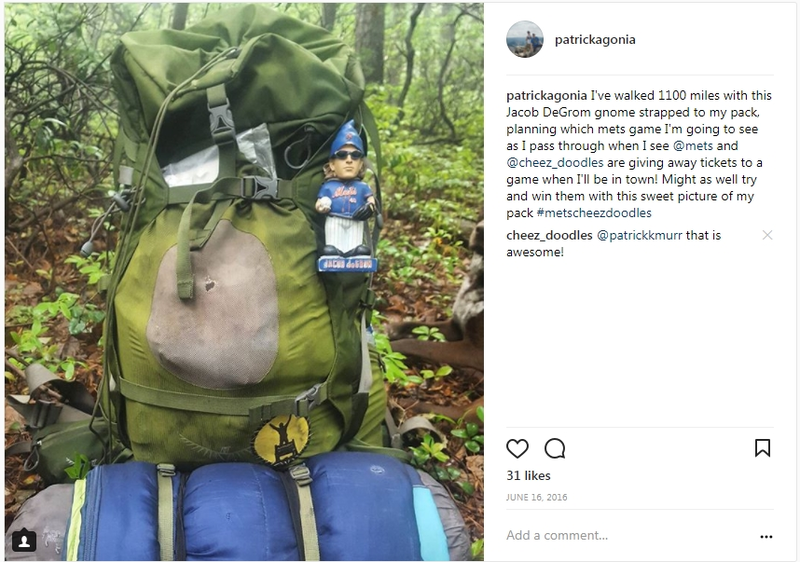 I went about my day hiking and forgot all about it for about a week, when I got a message from Cheez Doodles (the contest’s sponsor) that I was one of the five winners. I called up my dad to let him know I had a game for us to attend when I made it to New Jersey and a month later we were sitting on the third base line in a suite with eight other contest winners. We were pretty excited to be in the exclusive suite level. The game was against the Cubs, who worked their way to a 3-0 lead midway through the game. There were already fans making their way to the parking lot when Yoenis Cespedes got things started with a home run in the bottom of the sixth. The next inning the Mets tacked on three more runs and didn’t let go of the lead, despite Jeurys Familia ending the game with a shaky save with the bases loaded. 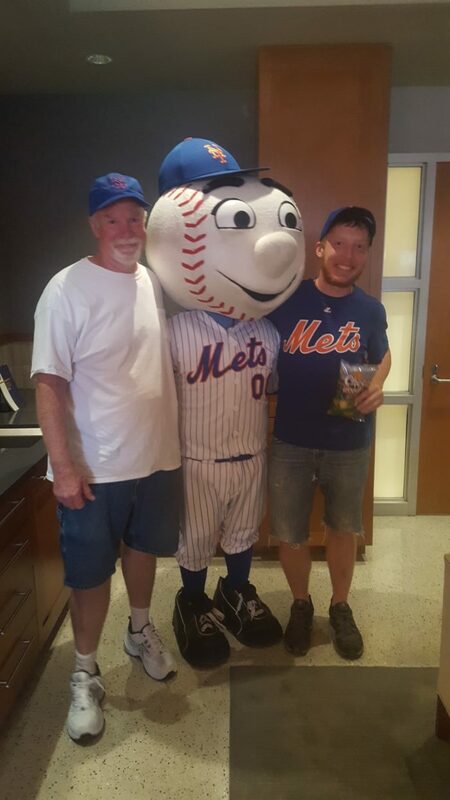 In addition to a thriller of a game, the suite had an all-you-can-eat buffet, a beer cooler, we each got a $50 gift card to the Mets’ store (I got a killer fitted hat for myself and some novelties for my sister), and they even got two celebrities to come to the suite: Mr. Met and John Franco. (Franco is considered one of the best lefty relief pitchers in the history of the game). As we left the suite at the end of the game we were given Cheez Doodle goodie bags and sent on our way. The game concluded my triple zero in New Jersey and the next day my mom dropped me off at Delaware Water Gap, where I was about two days behind my trail family. 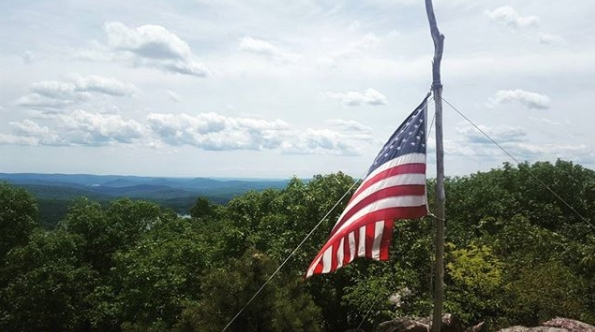 My goal was to catch them by July 4, so I got in a big mile mentality and busted out two 33-mile days followed by a 34-mile day and caught up with everyone in New York the night of July 3 – 100 miles in three days, my record for the whole trail. The funny thing about the whole side trip was when I met up with everyone, I barely even talked about it. I caught them up quickly on the food, booze, and my hat – but that was about it. It was almost like a dream I had. A dream of the best trail magic I could imagine. The view from Prospect Rock on my way to catching up with the trail fam. * A summary of the Mets’ 2015 season: The Mets went on to upset the Nationals with a late-season surge (complemented by a Washington slump) and take the division. The Mets squeaked by the Dodgers (3-2) in a Division Series highlighted by Chase Utley smashing into Ruben Tejada on a hard slide, breaking his leg. No self-respecting Mets fan has forgiven Utley for that. The Mets followed that up with a four-game sweep of the Cubs in the NL Championship, powered by unbelievable pitching. Unfortunately, the Royals beat the Mets in the World Series due to the team’s lack of hitting, questionable managerial skills, and a lackluster Jeurys Familia. All in all, the Mets did better than anyone could have imagined; it was a great season to be a Mets fan.